The summer season is off to a great start here in Lake Placid. The road cycling is incredible as are the many other outdoorsy things we do here in the Adirondacks such as hiking, trail running, paddling, water skiing, sight-seeing, swimming, fishing, mountain biking, and so on. Mirror Lake has finally warmed up thanks to the recent hot spell. It was fine swimming this morning without a wet suit, thank goodness. Still the Jersey Girl, I don't enjoy long swims in a wet suit. Wet suits are confining, annoying to deal with, and are for staying warm when you are in the ocean waiting for a wave. The occasional reward for going though all the trouble of putting it on is a fun ride. Anyway, the swim was nice and refreshing, and not at all confining. The season has begun and there are are tons of things going on here in the Adirondacks. A good resource for keeping up with what is going on the Adirondack Region is the Adirondack Regional Tourism Council's website. Lake Placid is buzzing too with the Marathon and Lake Placid Film Forum both coming up this weekend. As a matter of fact, a special, award-winning movie will be aired to coincide with the Lake Placid Marathon. "Spirit of The Marathon" will be shown at 4:30 p.m. this Saturday. The film's Producer/Director and marathoner Jon Dunham will introduce the film. Oh, today's photo is the Lake Placid office of the Prudential Terry Horrocks Real Estate office where I am an agent and was working this morning. 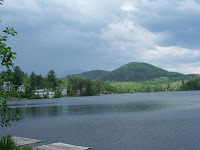 In the winter, I prefer the Wilmington office, but the Lake Placid office is the place to be in the summer. And today's blog post title is "Pinch me" because I must be dreaming that I live in paradise.